Took a 2017 Chrysler Pacifica Hybrid minivan for several drives earlier this month. I understand the value of minivans and their appeal to families and those, including tradespeople, businesses, outdoor adventurers and the like, who have loads of stuff – or just a few big things – to haul around all the time. I believe that many people who drive large SUVs would be better off in minivans. But while I can wholeheartedly recommend them to others, I am not a minivan person. That said, after the Chrysler Pacifica Hybrid arrived in my drive for a week’s worth of road testing, I drove. And I liked. I found it impressive on most fronts, wanting on none. I might not want one for myself, but I can strongly urge anyone considering a minivan now or in the near future to put the Chrysler Pacific Hybrid on the shopping list. Put it way up at the top if good fuel economy (actually, for a minivan it is great fuel economy) and the correspondingly low emissions and infrequent gas station visits are at all important. This is, after all, the first and so-far only hybrid minivan in the U.S. (actually it is a plug-in hybrid – more about that a bit later). In most reviews, the big criticisms of the 2017 Chrysler Pacifica Hybrid are cost and the loss of the company’s trademark “Stow-n-go” seats in the middle seating row. Granted, the Pacifica Hybrid is pricey at first glance. It comes in just two trim levels. The base “Premium” model starts at $43,090 including Chrysler’s $1,095 destination charge. top-of-the-line “Platinum” starts at $46,090, including destination. The Pacifica Hybrid Platinum with optional sunroof that I tested carried a sticker of $47,885. 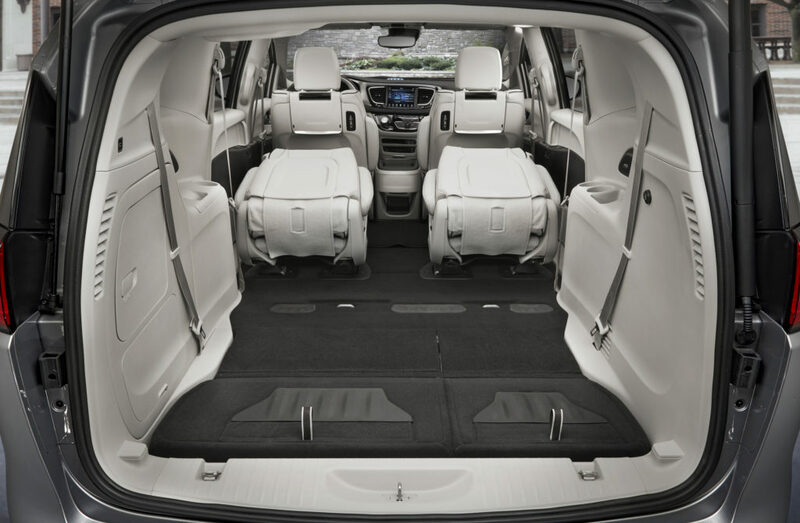 Each trim is incredibly well-outfitted with family-friendly features and the 2017 Pacifica Hybrid Platinum comes with an impressive suite of advanced safety systems as well. A huge plus for the budget conscious: The Pacifica Hybrid carries a super-sized battery pack that qualifies it for the same maximum federal tax credit as fully electric cars such as the Chevrolet Bolt, Nissan Leaf, BMW i3 and Tesla Model S and Model X.
That’s up to $7,500 in the year which the vehicle was purchased. While the amount is dependent on the buyer’s actual tax bill for that year, it’s a pretty good bet than most buyers will qualify for the maximum. The federal credit offsets income taxes paid or still owed, up to a total of $7,500, but doesn’t get you a refund check from Uncle Same if, say, you only owed $5,000 that year; if that were the case, you’d just get a $5,000 tax credit. In some states, there are state and/or regional incentives that can include cash rebates or state tax credits. Those two items add up and make the Pacifica Hybrid a lot less costly than the sticker price might suggest. In California, for example, a 2017 Chrysler Pacifica Hybrid Premium without the optional sunroof carries that $46,090 MSRP. But that’s before a $2,500 state rebate and the $7,500 federal tax credit – which combine to cut the effective cost to the buyer to $36,090. Colorado provides a state income tax rebate of up to $5,000 for a $33,590 effective cost for many buyers. The effect of the federal tax credit is to make both trim levels of the Pacifica Hybrid thousands of dollars less expensive than similarly-equipped standard internal combustion models – from Chrysler and from its competitors in the minivan segment – even though the ICE minivans mostly carry lower sticker prices. In states with state or regional incentives, the Pacifica Hybrid simply becomes an even greater bargain. If you prefer to lease, the federal tax credit is factored-in by Chrysler to help reduce monthly payments. In many states with incentives of their own, lessees get the same rebates or credits as buyers. And that’s before you start factoring things like annual fuel savings and potentially reduced maintenance and repair costs: Electric assist from the hybrid system can extend the gas engine’s life and reliability by relieving it of a lot of stress and strain; regenerative braking makes hydraulic brakes last a lot longer, and electric motors are virtually maintenance free. Yes, it’s a bummer, but the battery occupies the space that is given to underfloor storage for the middle-row seats in the Pacifica ICE models. No Stow-n-Go except in the third row, where the 60/40 split bench seat folds away under the floor with amazing ease – just gentle tugs on a couple of straps. 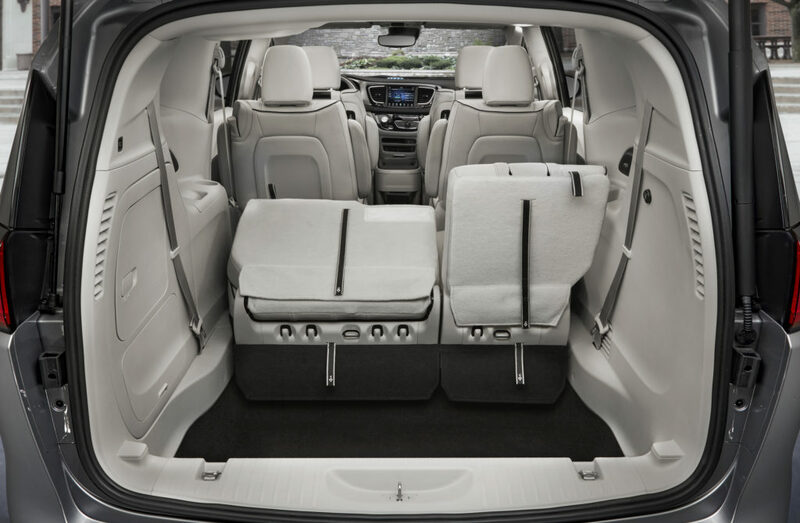 As a result, you get a pair of captain’s chairs with fold-down seatbacks for the second row in the Chrysler Pacifica Hybrid. If you need a flat floor there, you have to take those two seats out. Fortunately, that’s fairly easy. 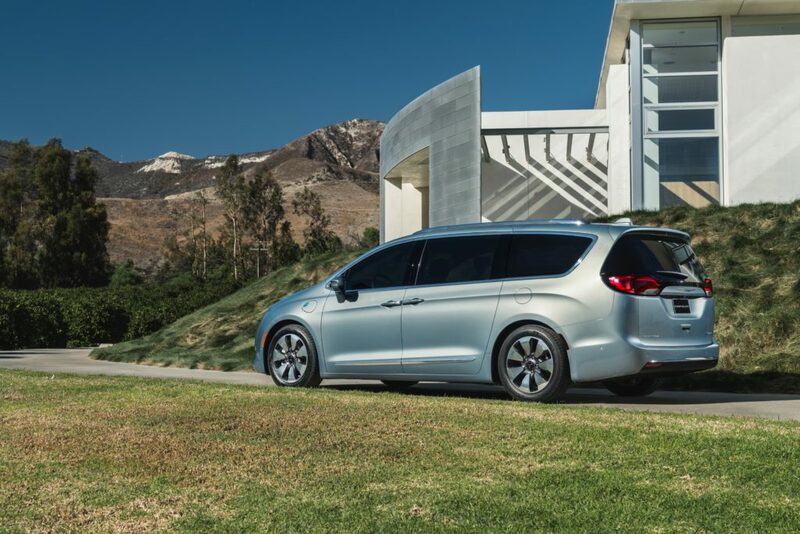 Additional bummer – you can’t get the optional third seat in the second row, so the Pacifica Hybrid comes only as a seven-seat minivan while all but one of the Pacifica ICEs can be optioned for eight seats. Fab fuel economy for a minivan. An EPA-rated 32 mpg when running in a conventional hybrid mode after the battery charge has been depleted; 84 mpg-equivalent (per the EPA) when using electric drive only. Up to 33 miles of all-electric range. It’s a plug-in hybrid, so thanks to its much larger battery (16 kWh), you get correspondingly more all-electric operation than a conventional hybrid would provide. Comfortable ride in most conditions; quiet cabin. Tons of standard features and luxury touches. On concrete slabs or other road surfaces with regularly spaced ridges or gaps, the Chrysler Pacifica Hybrid has a tendency to porpoise (bouncy front-to-rear, kind of like a porpoise gently gliding in and out of the water as it swims). Slightly less leg room in the second and third rows than two potential competitors, the gasoline-only Kia Sedona and Honda Odyssey minivans. Because the federal tax credit is applied at the end of the tax year, you still must qualify for and finance the Pacific Hybrid’s higher sticker price. 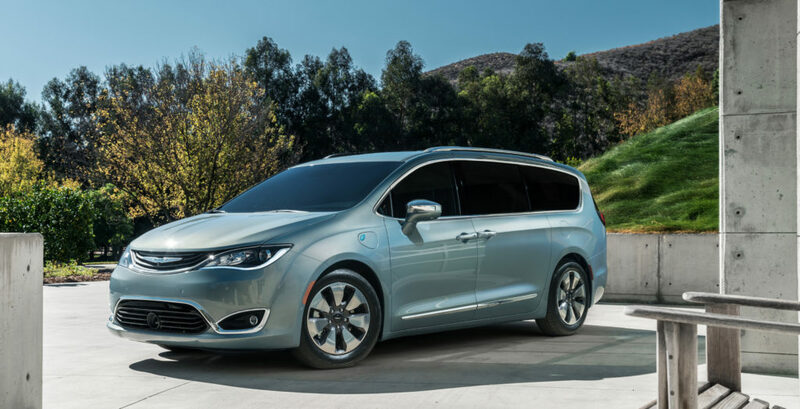 The Chrysler Pacifica Hybrid looks like the regular Pacifica, which looks like a minivan with a rounded nose and corners to take the edges off and reduce the boxiness as much as possible. The sliding door tracks are neatly hidden in the rear quarter window’s black surround. 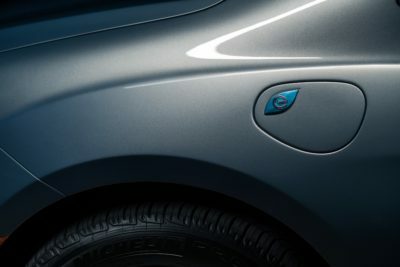 Chrysler has outfitted the hybrid with leaf-shaped blue “e” badges to denote that it is electrified, a different grille (curvy black plastic bars instead of black honeycomb grid), unique alloy wheel designs, a hybrid-specific instrument cluster and has given it one unique exterior color – silver teal pearl – in addition to the standards Pacifica colors. 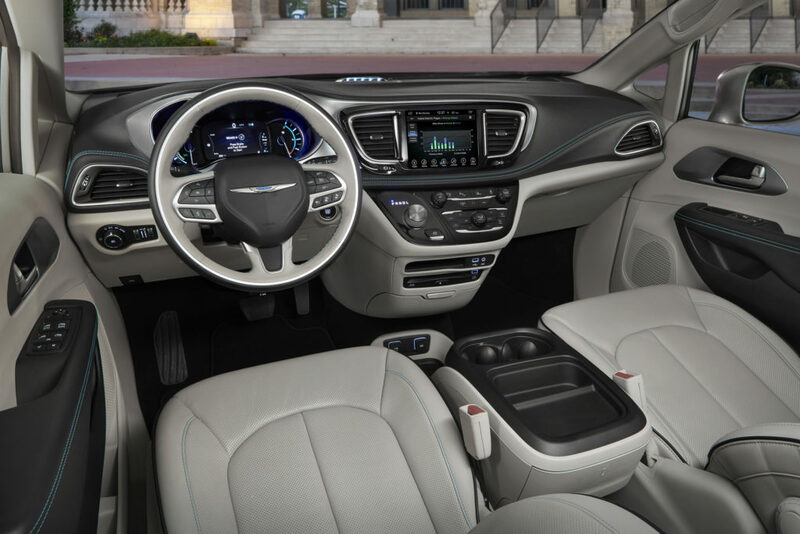 The 2017 Chrysler Pacifica Hybrid uses a slightly modified, 220-horsepower version of the standard Pacifica’s 3.6-liter V6 gas engine, coupled to an electronic continuously variable transmission, or CVT (Chrysler calls it an EVT to accentuate the “electronic”). It is outfitted with two electric motor/generators that augment the gasoline powertrain and are powerful enough to run the Pacifica Hybrid in all-electric drive some of the time. Combined peak output is 260 horsepower. The motors draw power from a 16-kiloWatt-hour battery pack that is charged from the grid and then kept partially recharged during longer trips via the hybrid’s regenerative braking system. The transmission is not plagued by the annoying drone some CVTs make as they work to keep the engine in the most efficient power range for the task at hand. There are no driver-selectable operating modes on the Pacifica Hybrid, not even a button to push to keep it in all-electric mode when the battery if full. Chrysler has opted to let the on-board powertrain management computer make all the decisions about when to use electric-only, mixed gas-electric and gas-only driving modes to ensure maximum fuel economy. The EPA rates the 2017 Chrysler Pacifica Hybrid at 84 mpg-equivalent in all-electric mode and 32 mpg in standard gas-electric hybrid mode, with up to 33 miles of all-electtric driving range on a fully charged battery. Driving styles, terrain, ambient temperatures and passenger and cargo loads all will affect efficiency. I managed an average of 30.2 mpg over a week of mostly around-town driving that included climbing a steep hill at the end of every trip. Chrysler doesn’t use the term in its model name, but the Pacific Hybrid is actually the Pacifica plug-in Hybrid. It performs best when its lithium-ion battery pack is charged from the grid. A fully deleted battery pack can be recharged in about two hours using a 240-volt, Level 2 charging system or in a bit more than 14 hours using a standard 120-volt household circuit. The 2017 Chrysler Pacific Hybrid rides and handles pretty much like the regular ICE models, although nearly 600-pounds in extra weight (those batteries) concentrated mostly below the floorboards give it a more sure-footed, stuck-to-the-pavement feel, especially when cornering. The extra weight costs a little bit in acceleration, but not much. 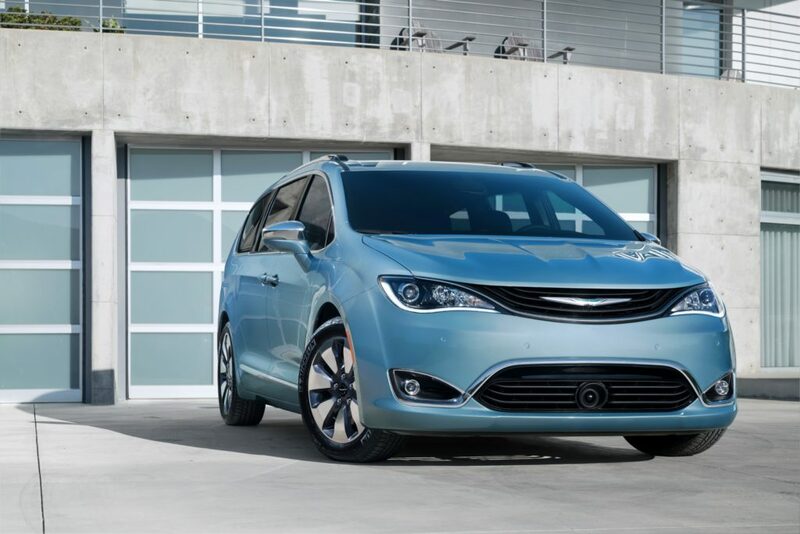 Chrysler’s test results show that in a 0-60 mpg sprint, the nearly 2.5-ton Pacifica Hybrid turns in a respectable 7.8 seconds elapsed time, versus 7.3 seconds for the internal combustion model. Standard features include 17-inch alloy wheels, automatic headlights, LED running lights; fog lamps; heated, power-folding side mirrors; automatic three-zone climate control; 6-speaker AM/FM/satellite audio with USB and auxiliary jacks, Bluetooth connectivity and voice command capability; front knee and side airbags and side-curtain airbags in all three seating rows; power sliding doors and liftgate; power windows in second-row doors; seating for seven; leather seating; heated front seats; power 8-way driver’s seat with 4-way lumbar support; stow in floor, 60/40 split 3rd row seating; removable 2nd row seating with folding seat backs; keyless entry and remote start system, rotary dial shifter; leather wrapped steering wheel with tilt and telescoping steering column; 8.4-inch infotainment touchscreen with Chrysler’s Uconnect system; 7-inch color digital driver information display; rear parking sensors, stability control, automated parallel and perpendicular parking system; blind spot monitoring and rear cross-traffic detection. Premium trim adds 18-inch alloy wheels; heated steering wheel, power front passenger seat; ventilated front seats; upgraded leather and a black leather upholstery option (“alloy” is shown); GPS navigation; hands free sliding doors and liftgate; adaptive cruise with full stop and go capability; forward collision warning with braking assistance; lane departure warning; front, rear, parallel and perpendicular parking assist with rear full stop capability; advanced brake assist; 360-degree “surround view” camera system; rain sensitive windshield wipers; automatic high-beam control; 506-watt, 13-speaker Alpine audio; seatback video screens with wireless remotes and headphones; Blu-ray DVD player; dual HDMI inputs; USB video port; auxiliary power outlet. The only options are a $350 wireless device charging pad for the Premium trim, a $1,795 panoramic tri-pane sunroof for the Platinum trim and a $495 vehicle tracking system for each.